The European blackcurrant (Ribes nigrum L.) is a deciduous perennial shrub, growing up to 2 metres in height which produces greenish white flowers and shiny black globular berries. It is grown in gardens for its fruit (for cooking or making jam) and there are ornamental strains, with variegated or cut-leafed foliage. Commercially, it is sometimes grown for the essential oil extracted from the flower buds, or for the leaves which can be used to make a herbal tea, but primarily for its fruits, which are rich in vitamin C. These can be used for the manufacture of jams and fruit juice, or as a food ingredient, but the main commercial use is for juice extraction, which is then used as the basis for alcoholic (e.g. crème de cassis) and non-alcoholic beverages. After the juice has been extracted, the fruit remnants ('pomace') may be used for the extraction of pigments, and the seeds contain an oil rich in important fatty acids, which are used in the healthfoods and cosmetics. Genetic resources, including taxonomy, distribution, germplasm locations and a selection of printed literature references. Tables of world commercial production and selected cultivars. Sections on: taxonomy, cultivars, origin, history of cultivation, folklore, medicinal properties, non-food uses, production statistics, botanical description, general culture, contribution to diet, and food uses. 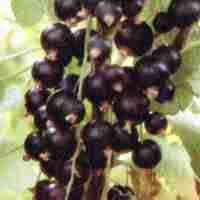 Website offering a range of information on many aspects of blackcurrant growing and use. Overview of the characteristics of the plant and its many uses. An association of UK growers promoting the use of blackcurrants. The site contains useful information on a wide range of topics. Botanical description of the American Black Currant (Ribes americanum). Botanical painting by Carl Lindeman (1901-5). Growing instructions for currants in California, USA. Advice on vine weevil diagnosis and biological control. Picture of magnesium deficiency symptoms in blackcurrant (item 46 in the list). Garden production of currants (Washington State, USA). Commercial growing instructions for currants in Ireland. Growing instructions for currants in Ontario, Canada. Overview of the varieties currently in cultivation. Most papers are available as abstracts or full-text versions. Ribes breeding and research in the UK. SCRI project for the use of marker-assisted breeding. Full text of most contributions available in pdf format. Developing conservation methods for blackcurrant genotypes. Information on the antioxidant properties of blackcurrant fruit. International standard for concentrated blackcurrant juice preserved exclusively by physical means (pdf file). International standard for blackcurrant juice preserved exclusively by physical means (pdf file). Data sheet for 2-Methyl Tetrahydrothiophen-3-One, a flavour compound from blackcurrant juice. Recipe for home-made Creme de Cassis. Recipes for 27 cocktails using Creme de Cassis. Two recipes for home-made blackcurrant wine. Overview of the health benefits of anthocyanins. For information on seed oil, see www.blackcurrantoil.info. The INCI (International Nomenclature of Cosmetic Ingredients) names for a range of natural oils. Recipe for blackcurrant and lemon verbena tisane. Article suggesting that fruit teas, such as blackcurrant, may damage your teeth. Original research article describing how blackcurrant anthocyanins can help relieve eye fatigue from using computer monitors. Full text available by searching on 'Black Currant VDT' in findarticles.com. "A Modern Herbal" - Uses of plant parts as medicinal herbs. Includes recipes for use in jelly, wine and jam. Fascicule 4 contains information on the herbal uses of blackcurrant leaf. Around 30 links to sites featuring the currant family (Ribes). Uk - government funded initiative to bring research and technology to the horticulture industry of England and Wales to improve growers' profitability. UK centre for government-funded blackcurrant research. Trade association for the UK soft drinks industry. Mail order fruit juices and yoghurts. Specialist suppliers of fruit and non-frozen juice to UK and European packers. Also market a range of cordials to consumers. Major US producer of blackcurrant beverages, Site includes information on health benefits, recipes and cultivation. Manufacture a wide range of fruit liqueurs, including Creme de Cassis. Manufacturers of Creme de Cassis since 1841. Produce a wide range of jams and jellies. Supply a range of traditional fruit jams. Fun site, but long download. Manufacture a range of high quality jams and preserves in Essex. Twinings blackcurrant fruit and leaf infusion in teabags. Flora produce a range of medicinal teas containing blackcurrant leaves, including FluGrip, Rheumadix and Stomach Tea. Offers at least four tea products containing blackcurrant. Use the on-site search facility to find details. For information on seed oil, see www.blackcurrantoil. info. Organic farm enterprise supplying juice, pulp and bud macerate. Supplier of organic frozen blackcurrant berries. Suppliers of fresh and frozen fruit. Suppliers of a wide range of frozen fruit and fungi, for local and export markets. Trade suppliers of a range of fruit juices and concentrates. Offers a wide range of infused and carrier oils. Supply a range of colours and fruit juice compounds. Major world supplier of flavours and fragrances. Suppliers of 'currant bud absolute black'. For information on seed and seed oil, see the blackcurrant oil page. Supplier of fruit and herbal teas to the trade. The site has English, German, Polish and Russian language versions.